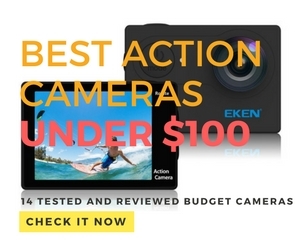 If your camera is failing to keep up with you in extreme situations, during vacations, or on a day at the pool, it is probably time for you to have a look at these 14 best budget action cameras under 100$ for 201. An action camera is usually the first thing adventure lovers and explorers pack in their bags, when they are leaving for their next journey. Now, unless you are a tech geek, you may be wondering how an action camera is so cheap. Most people relate an action camera with a GoPro, which has single-highhandedly made this electronic gadget a house hold name across America. However, GoPro is a high end brand and getting one of its cameras is not suitable for any one on a tight budget. One of the primary reasons why people decide to go for an action camera is that these things are rugged and protected from environmental factors in such a way that you never have to worry about their longevity. 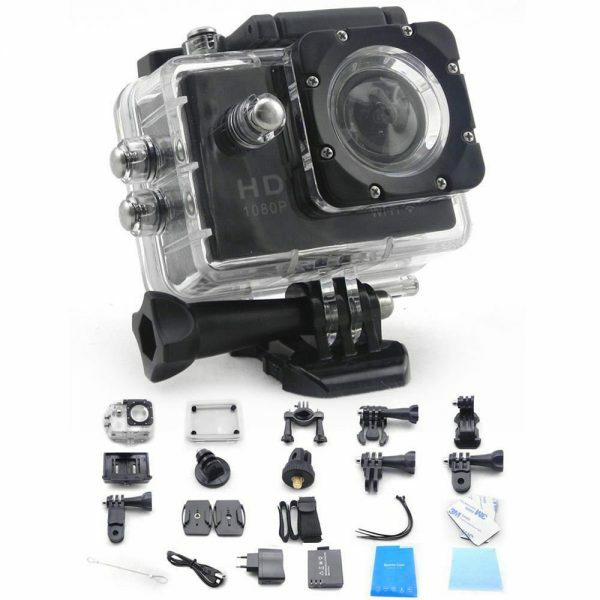 Action cameras allow you to capture the full experience of your ski runs or scuba diving adventures. Their solid appearance, reliable features and ease of use set them apart from ordinary counterparts. However, action cameras do not come in cheap; especially GoPro cameras so impulsive investment may not be a great option for someone with a tight budget and not looking for a pro cameras like the Hero 6 Black. 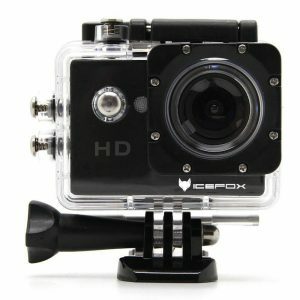 What To Look For While Buying an Action Camera? Before deciding to buy an action camera, it is important to understand the basic features and set a few criteria that your choice must satisfy. I wrote a detailed article on how to choose the best action camera, make sure you check it out. Firstly, you need to be absolutely certain about the kind of shooting you are planning to do with the camera. For example, if your activities involve water, it is reasonable to go for a product that is not only tough and durable, but also water resistant. 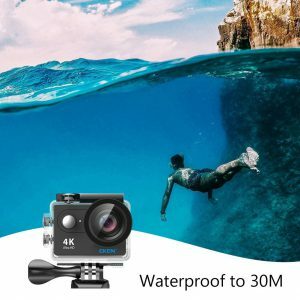 Some action cameras can survive for a few feet under water – a feature that comes in useful if you are planning to go scuba diving in future. Action cameras must not be too bulky. They should be compact, portable, and mountable. Mounting options are what make the camera versatile. Not all action cameras are ideal for all kinds of sports, and it is only prudent to go for the one that suits your taste the best. Video quality and frame rates are of secondary importance, but you have to make sure that your camera doesn’t lag in that field either. Expressed as frames per second (fps), frames rates matter when you decide to slow your captures down and edit them for dramatization. Video quality, on the other hand, is a double edged sword. The higher the quality of the video, the better is the resolution, and larger is the size of the file. With its small size and compact design, the Polaroid Cube + looks adorable. It basically offers similar features as its predecessor, but comes with Wi-Fi technology for easier and more convenient control of the camera and quicker access to image and video files. It records 1080p videos, 8 MP still pictures, and can capture time-lapse photos. It can also record in 1440p at 30 fps. Its features are really close to the GoPro Hero4 Session. It has to be mentioned here, that the video quality in this case is heavily compressed. While this allows for smaller file sizes and better flow of data to the SD card, the compression can result in seriously ugly effects in some videos. In contrast to the Polaroid Cube, this camera provides image stabilization – a useful feature to have if you are troubled by the shakiness in video footages. The fact that the camera does not come with a mount may lead you to question whether it’s even meant to be an action camera at all. Although not the best buy at this range, the Polaroid Cube+ adds enough punch with its looks and functionality to be considered among the top 10 in this category. Although better known for their smartphones, Yi entered the action camera market quite a while ago. Shooting in real 4K at 20 fps, the camera offered an affordable alternative to the more popular GoPro models. Understandably, with time, Yi gradually defined its own market under $100. The specifications are more than decent when you consider the price – Sony IMX206 sensor that gives 16 MP photos and videos in full HD 1080p at 60fps, Wi-Fi support and storage up to 64 GB on micro SD card. It can also shoot in 4K resolution at 20 fps. The battery life has improved a lot from its previous model and can now give you up to 130 minutes of video recording at 1080p 60fps. Yi kept the design simple and sleek – a power button in the front and a shutter button on top are all that there is. A gorgeous LED ring on the front indicates battery level and two red LEDs on the top and bottom indicate mode. If 4K at higher frame rates is not a priority for you, the Yi is the model to go for. Some users may be bothered with the slow start-up time (around 5 seconds), but usually, that should not be a deal breaker. The camera records at 4K:20 fps, 1080:60 fps and 720:120 fps. The camera captures still images at 12 MP resolution. The battery life is up to 130 minutes. The SJCAM SJ4000 is a great example of an action camera that packs in all the basic necessities, but refuses to venture beyond. It doesn’t top the charts in any category, but scores well enough overall to feature in our list. The video quality is decent, but not amazing. It works reliably underwater and renders reasonably good diving and swimming videos. The appearance is not eye-catching at first sight, but that should hardly matter in a budget product, right? It is rugged and waterproof, and those are the qualities you should be actually looking for, once the functionalities are satisfied. On one hand, the camera comes with a built-in Wi-Fi for easy connectivity and convenient access to images and videos, while on the other, it offers a below average 900mAh battery that lasts for only 70 minutes. So if you are planning to go on a vacation with this camera, it might be a good idea to carry two additional batteries with you. The video is recorded at 720p:60 fps and 1080p:30 fps. 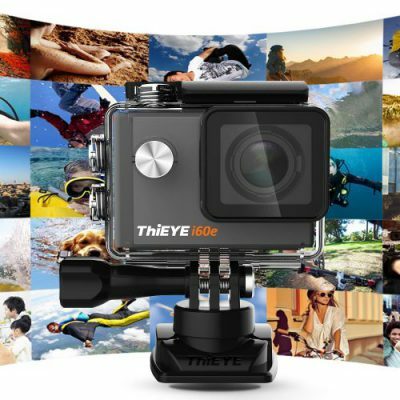 The ThiEYE i60 Wi-Fi action camera is yet another under $100 model that comes with all the perks of a GoPro product at less than half the price. It’s a small camera with a built-in display and a 152 degrees wide angle lens that can record 1440p at 30 fps and 1080p at 60 fps. The still images are sharp and clear, and have a panoramic touch, courtesy the lens. The camera comes with a waterproof case and several essential accessories, but if you planning to do more with it, you will have to buy a body harness or a head harness. The removable battery has enough juice for recording more than an hour of video on a single charge. The ThiEYEapp focuses on customer satisfaction with its simple and user-friendly interface. Moreover, you can connect the camera with your smartphone if you are more comfortable with remote control. The microphone recording quality also stands out because of its crisp sound. 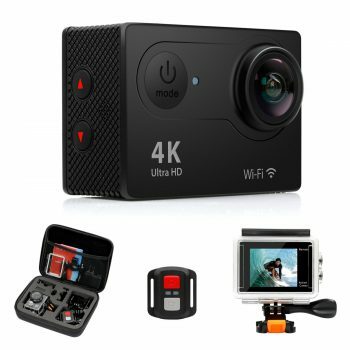 For those looking for a nice, little action camera that is highly rated in the market, this is a model to be kept under consideration. The camera shoots images at 12 MP, 8 MP and 5 MP. One of the best things about the Akaso EK7000 4K is its price. This doesn’t imply that its features aren’t great, but at less than $70, any action camera is bound to be a fantastic deal even if the specifications aren’t too impressive. The camera features a 2 inch LCD display and comes with Ultra HD resolution, which means you can record videos in 4K at 25 fps. The 12 MP burst photo ensures you do not have to compromise on picture quality while going for such an inexpensive model. The camera comes with two 1050 mAh batteries; so you can swap one for the other in order to extend the usage time. It’s better than the previous EK5000 model, so you can get up to 90 minutes of continuous recording with the EK7000. It comes with a 2.4Ghz wireless remote control that enables you to have more control of your camera, change settings and frame your shots directly from the phone app. Akaso has really improved from this model compared to the previous one, they added WiFi so you can share your videos and photos to the internet in seconds. They also provided an HDMI port which gives you an option to connect your camera to an external monitor or TV and watch your footage on a bigger screen. The camera itself is not waterproof, but you can find a waterproof case in the box that will make the EK7000 submerge in water down to 100 feet or 30 meters. The VicTsing action camera is a stylish model that has a tempting price tag attached to it. There are all but four buttons on the camera, each, interestingly, serving more than a single function. For instance, the power button also helps you navigate through the different camera options and set the mode. The 2.0 inch HD LCD display is paired with 170 degree wide-angle fisheye lens. The camera can capture 12 MP crystal clear photos and shoot videos in full HD 1080Pp at 30 fps. You can adjust the ISO sensitivity, exposure, sharpness, and white balance in order to get the best out of it. It comes with a waterproof case, and has built-in Wi-Fi technology so that it is easier to transfer files to your smartphones whenever you need it. The ICE-FOX action camera has as many as four color variants to choose from – black, blue, pink and silver. 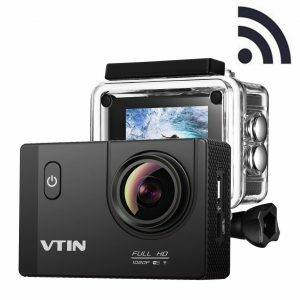 It is a rugged, waterproof camera that you can take with yourself to diving, swimming, skiing, and cycling. The fact that it is water resistant only up to 30 feet may sound like a setback, but that’s pretty much the average you can hope to get at this price range. It can record high quality videos in 1080p at 30 fps, the output format being MOV or h.264. There are not many cons to talk about except the battery life which is only 70 minutes. The fact that the Li-ion battery can take as much as 3.5 hours to charge fully makes it worse. The only solution to this issue, therefore, is to carry an extra pair of batteries while traveling. The specifications for the Eken H9R are quite convincing on paper. Whether that lives up to its billing is, however, what matters in reality. If you have never used a GoPro in your life, or are a beginner in this field, the Eken H9R is the best value for money you can possibly get in the market right now. It can record 1080p at 60 fps, and 4K at 15 fps (it has to be remembered that this camera doesn’t provide true 4K). It can take pictures at 12 MP, which is precisely what a mid-range camera will offer. The 1050 mAh battery is a major boost, allowing 1080p recording for 1.5 hours continuously. The camera also comes with Wi-Fi, thus helping you to transfer image and videos files in a hassle-free manner. It can be a substitute to the much more expensive GoPro Hero 4 Silver. I have included a coupon code in the review, have a look and get a discount on the camera on checkout! 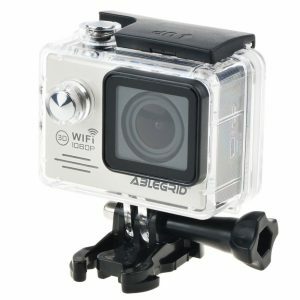 The ABLEGRID SJ5000 is a bestseller among sports and action video cameras, and not without reason. It features 12 MP HD 170 degrees wide-angle lens coupled with a 2 inch LCD display. It can record videos in 1080p resolution at 30 fps. The recordings are done in mov format; so you can rest assured that the file sizes aren’t unreasonably large. The camera package contains a number of useful accessories that you would have had to buy if they hadn’t been provided. A notable feature to look out for here is the motion detect, which probably acts as a prime reason why this product is considered one of the best sports cams in the market. The cons include poor night mode quality, low Wi-Fi range, and the inability to save the video recording to SD card on live mode. Further, the 900 mAh batteries are a headache not only because of their short life, but also because you have to buy extra ones from other sellers since ABLEGRID doesn’t manufacture batteries themselves. At first look, the Amkov AMK7000S seems to be a decent package with tons of accessories, features, a rechargeable battery, and a lightweight design – all of these costing you not more than a hundred bucks. It features 170 degrees wide-angle lens that can shoot 4K ultra HD videos at 10 fps and 1080p at 30 fps. If you are a fan or water-sports, you can take this camera with you without any worry. It is waterproof up to 40 feet, and the waterproof case that comes along with the product is a perfect fit. The 1150 mAh adds another incentive to buy this camera. Some users did report issues with charging and other ports, but that may have been individual manufacturing problems rather than generalized ones. I never expected to see good quality videos and photos from the Elephone Explorer but for the price you pay for it, it can be a great camera for beginners or someone who’s not willing to pay much for an action cam. The manufacturer claims that the image sensor is 16MP but some people are saying that it’s not 16 but I’m not sure how they figured this out. The camera can shoot in 4K at 15fps, I wouldn’t recommend to shoot with 4K as the quality isn’t good and I think that’s because of the slow processor. However, the quality in 1080p and 720p is great so I recommend you to stick to these resolutions. Audio quality if ok, not that great honestly, it’s like the sound is muffled. 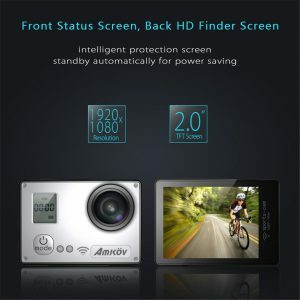 The 2.0 inch LCD screen at the back of the camera makes it easier to frame videos and photos, it’s a great addition for this extremely cheap action camera. The battery capacity is 1050mAh and can last around 1.5 hours. A nice addition to the bundle is the WiFi remote control which gives the ability to control the cam from a distance, this is something I never expected to have for such a cheap price. Some other features include, time-lapse recording, image rotation and WiFi app. 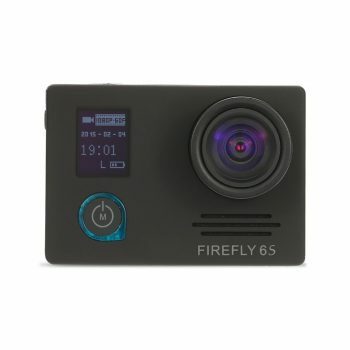 Some of you may have heard of the Firefly 6S action camera manufactured by Goolsky, it’s another good camera that makes it in this list. The Firefly 6S comes with a SONY Mega Pixels back illumination CMOS sensor, something that you wouldn’t expect to have but that makes it a good quality camera capable to shooting 4K at 24fps (quick time player required), 2.5K at 30fps, 1080 at 60fps and 30fps 1080p 30fps, 720 at 120fps (this option is great for doing slow motion videos!). It does have a small monochrome LCD at the front that displays video resolution, date, time and battery meter. No back LCD screen which is fine as everything can be controlled using the buttons and the front screen. WiFi is also an added value to this camera and is beneficial for videos/photos preview and playback using your smartphone and a special app. I was a bit surprised to see that the battery has a capacity of 1600mAh which provides a run-time of around 2 hours. Memory wise, it supports up to 64GB TF cards. That being said, even with its low price, this camera provides a lot of good options and quality videos/photos. It can be a choice for someone who’s not willing to spend much. Manufactured by IconnTechs IT, this action camera is a another good and cheap substitute of the more expensive GoPro cameras. Of course, they’re not similar in terms of quality but they can be a good backup for your GoPro. IconnTechs IT are really proud of the chipset they used in this camera which is the Novatek NT96660, it’s combined with the SONY cmos sensor. The Novatek chipset is a good addition and really helps with the quality of the videos and photos. Combine that with the Sony sensor, and you get yourself a cheaper version of the GoPro Hero4 silver. This chipset enables the camera to shoot up to 4K at 24fps, however I didn’t like the quality and some people also had the same reaction. However the camera performs well when shooting in lower resolutions like 1080p and 720p, and that is enough for many people especially amateurs. It has a Gyro image stabilization feature and can take 20 Megapixels still shots. The back LCD screen offers the benefit of framing your shots, it’s not a touchscreen like the GoPro one but it’s good enough. It also has 60fps burst mode, WiFi and an average battery life of around an hour. 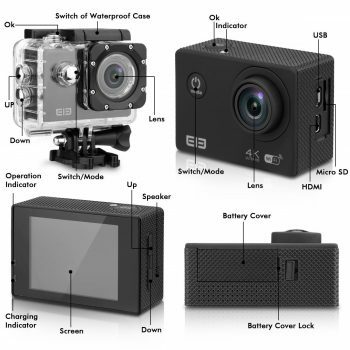 Unlike the other cameras within this list, the IConnTechs IT action cameras supports 128GB SD cards for extended shooting time. The Fitfort action camera has a lot of positive reviews and I think it’s due to the fact that the manufacturer is honest about the claims, whether it about the 4K resolution or the battery capacity. What you see is what you get with this Fitfort. With a 12 megapixels image sensor and 170 degrees super wide lens, this camera delivers a good quality videos and photos. I personally didn’t like the 4K resolution as I found it a bit choppy, I think I’m used to the super high quality of my Hero 5 Black! It comes with 2x 1050mAh rechargeable batteries that each can last up to a 1.5 hours of continuous recording. What I Iiked the most in this camera are the additional features like WiFi and the smartphone app “Ez iCam” that’s compatible with IOS and Android, you can watch the preview, playback and record using the app and that is very convenient for me and I’m sure it is for you as well. The 2 inch LCD screen at the back is also an added value while keeping in mind that it’s not touch but that’s fine. The bundle also includes a wireless remote control which is very convenient especially when doing activities like hiking and mountain biking, you can start/stop recording in just one button while the remote is attached to your wrist. The bundle also includes a free travel bag for your camera and 19 different accessories. All this for the same price that is way less than $100! An action camera makes for a great tool to capture your precious memories during your travel or even just for recording the daily moments. As you can see, the features (just like the prices) can vary a lot depending on the camera you are going for. It is important to keep these in mind before making a decision. I compiled this extensive list after a thorough research and product testing, which means that most of the products listed here have made it through my stringent checks and are better than other budget action cameras which populate the market. Meanwhile, reviews can only list down pros and cons of a product, and that is precisely what I strive to do in this case. Ultimately, however, it always comes down to the user and his unique needs. I hope you found the information in this article useful. What do you think of the above cheap action cameras under 100$? Soocoo S100 is the best out of 5 I have used under $100. It has gyro stabilization and several angles starting at 170° as widest. Cost around $80. Thanks for shedding the light on the Soocoo S100! I will definitely check it out and see if it will make it to the list.